Jim Davidson once cancelled a show in Plymouth because there were wheelchair-users in the front row. Now disabled comedian Laurence Clark has turned the tables on the ginger gagster by refusing to perform if Jim Davidson is in his audience! Laurence points out: If Jim can do comedy about us then I don't see why disabled people can't do the same in return? Laurence's show turns the tables on comics who do 'disablist humour'. 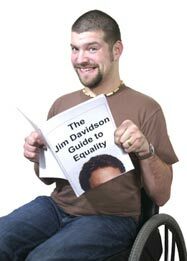 The Jim Davidson Guide to Equality, cleverly cuts and draws comparisons - between Jim Davidson's stand up show and Tony Blair's manifesto speeches. The result is a hilarious insight into the two 'performers' on their respective stages in the style of a fascist rally. As the country prepares for another general election, Clark's bitingly funny, hard-hitting commentary draws uncanny parallels between Davidson and Blair. As he lambasts the Prime Minister's empty words and broken pre-election promises, he attempts to establish whether Davidson or Blair has the better grasp of equality issues. Comparisons are drawn between Tony Blair's pre-election speeches and manifestos and Jim Davidson's 'comedy' leaving us with the message: Vote Jim Davidson! Is it any worse than the alternatives? A brilliant, incisive writer, Clark regularly contributes to a variety of comedy, political and disability publications and was recently a guest reporter on BBC 2's Newsnight.